In this week's #StatAttack we look at David Williams' contribution following that goal as a super sub against Sydney FC. In this week's #StatAttack we look at David Williams' contribution following his goal as a super sub against Sydney FC. Williams came off the bench to score a fantastic goal, running with the ball inside his own half before jinking past two opponents and slotting home a memorable winner. The match was Williams' 16th appearance this season for Melbourne Heart, with the winger missing one match (the 2-2 draw with Adelaide United) through a minor ankle injury. Williams has started 13 of those 16 matches, with three of appearances - including Friday's - as a substitute. Williams has therefore played 1130 minutes of football this season, with his strongest contribution coming in the form of his goal scoring. Melbourne Heart's number 15 has netted on five occasions this season; scoring twice against Central Coast Mariners in Round 2, before scoring singles in Rounds 8 and 9, against Adelaide United and Western Sydney Wanderers, respectively, and his most recent effort in Round 17 against Sydney FC. Williams is ranked equal sixth on the Hyundai A-League goal-scoring charts, three behind joint top goal scorers Adam Taggart (Newcastle Jets) and Stein Huysegems (Wellington Phoenix), who both have 8 goals apiece at this stage of the season. 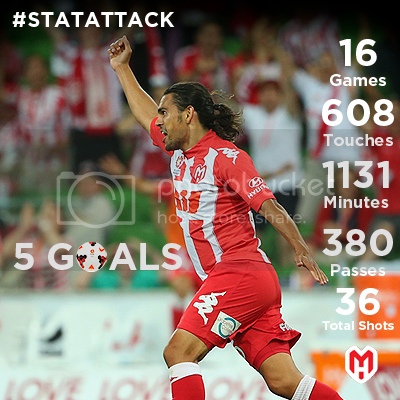 Check out some of Williams' stats below, as well as the leading Melbourne Heart FC players.